I am Canadian. When somebody accidentally bumps into me, I say “sorry.” When I’m in the company of non-Canadians, I remind myself to not say, “eh.” And when I’m cold I put on a toque. In Canada, a toque (also known as a beanie or knit cap in some other English-speaking countries) is the quintessential solution for warmth, regardless of activity or season. What’s not so clear is whether or not there’s a Canadian solution for footwear, particularly for water-based activities such as sea kayaking, whitewater rafting, and canoeing. Now, Alaskans are different. Their love for Xtratuf boots is clear. I have my own solution for footwear, one that works wonderfully for me. It might work for you too. It’s easy. Most of the time, I wear sandals that are well designed for water sports. Depending on the trip, I also carry light river shoes or, if I’m planning on big overland adventures, I take hiking boots. Sometimes people who see me in sandals (particularly if they’re in thick socks and boots) question whether or not I’m normal when it comes to feeling cold. I think I am. But let’s explore these thoughts further. I’m not the only one who thinks sandals are a great three-season footwear solution for water-based activities, rain or shine, most of the time. Lothar thinks so too. 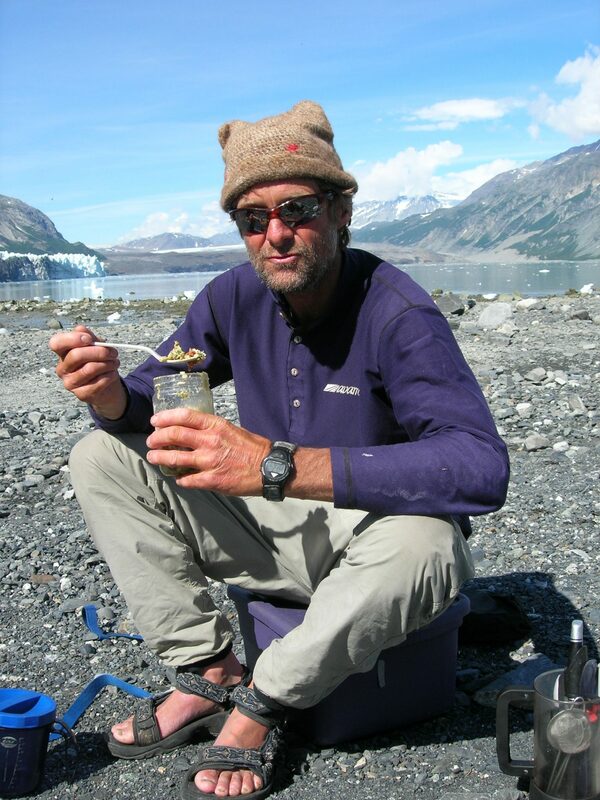 In the mid 1990s, I was searching for solutions for footwear around the same time I encountered a crew of Alaskan commercial whitewater rafting guides, each decked out in Cahartt pants and Xtrafuf boots. I met them on the mighty Alsek River, a cold glacier fed river that flows through the Yukon, British Columbia, and Alaska. I was intrigued by their garb. It was the first time I had seen these Alaskan clothing icons. But I wasn’t convinced, at least not enough to mail order them all the way from the U.S. Plus, I wasn’t sure (based on past experience) that I was coordinated enough and patient enough to not over achieve when it came to the water level relative to the top of my boots. Instead, I continued to pack my heavy leather hiking boots, running shoes, rubber boots (black shiny ones with the eraser coloured band at the top), neoprene socks, and Tevas. I’d don my Teva’s and then stuff the rest of my footwear into the bottom of my big red dry bag. When I got home and unpacked, I’d see the bottom of the bag for the second time. Then I’d declare the rubber boots were definitely out for the next trip, maybe even the hiking boots and running shoes too. I did this for many whitewater rafting trips because I couldn’t bear to leave any of them at home. What if I needed them? Now, I always leave my rubber boots and often leave my running shoes and hiking boots at home. My strategy for wearing sandals and staying warm too. My sandals are a three-season favourite for all kinds of weather. If I get cold, I put on a toque. As needed, I add thermal or wind protection top layers (e.g., fleece jacket, life jacket, wind breaker). I often wear quick drying shorts or 3/4 length pants because it’s easier for me to stay dry (or get dry again) when I’m in and around water. But if it’s really cold, I’ll put my fleece pants on and then I can easily hike them up if I need to. If it rains, I put rain gear on. The upside of wearing sandals: free those toes! Anyone who has spent time doing water-based activities knows how easy it is to get wet and how hard it can be to get dry. In my opinion, the single greatest advantage of wearing sandals most of the time is that my feet are dry and warm most of the time. When I get up, I don’t have to put on wet socks and boots. When it’s raining, my feet dry quickly when I’m under a tarp beside the fire and, if I’m sea kayaking, when I’m in my cockpit. As long I keep my body core warm, my feet are warm. Risk management: choosing footwear appropriate for the conditions. Cold water immersion hazard: Hypothermia is a real risk to consider on many of my trips. On days where the risk of cold water immersion warrants thermal protection, I switch to a dry suit with river shoes or, on some trips, a wet suit with neoprene booties and sandals or river shoes. I do this for crossing open water, running technically challenging rapids, or rowing or paddling in challenging conditions. I also carry fire paste to build a fire, a Helly Hanson one piece suit, locally dubbed the Bunny Suit (not sure if they make it anymore), and other supplies so that I can get dry and warm if I’m in an hypothermia-related emergency. 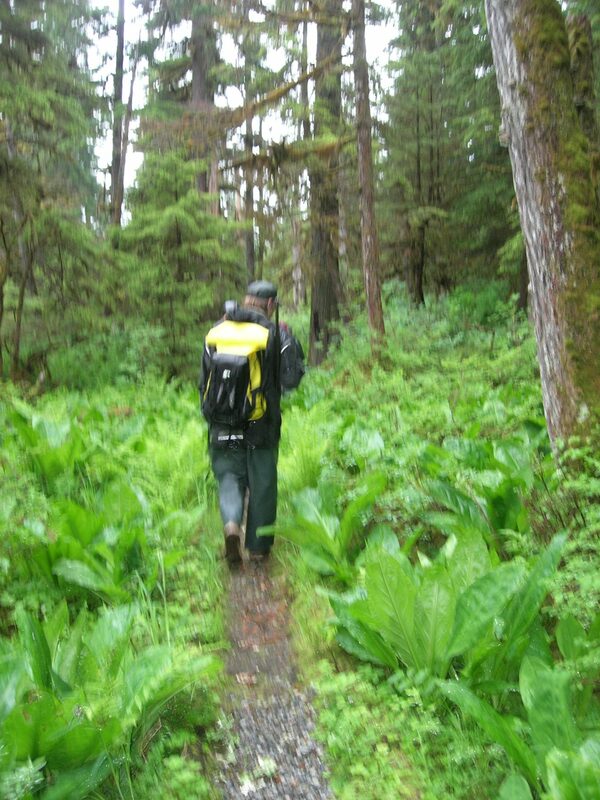 So far, I’ve only had to pull the Bunny Suit out once, at a particularly miserable campsite in Southeast Alaska. Shoreline hazards: In Swiftwater Rescue courses, I’ve been told that many (most?) accidents happen on shore. I find that it’s pretty easy to stay upright with sandals with Vibram soles but I know I need to stay focused. 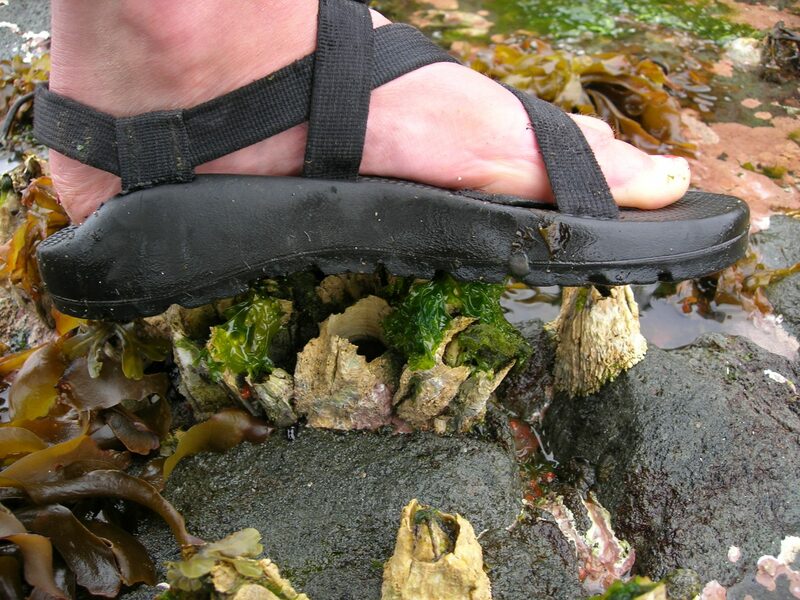 Some algae and barnacle beds can be treacherous to walk over. I negotiate these risks accordingly. Now, I’ve moved on to a pair of Chacos. Watch out for barnacles! Sometimes, when I’m living in domestic comfort, I forget how wonderful sandals feel and how functional they are for three-season use in the great outdoors. “Near-constant rain escorted us north. To appreciate the conditions, try spending the day lying fully clothed in a bathtub, under a steady shower of cold water. For realism, add a fan to simulate twenty-mile-per-hour winds. After two unrelenting weeks on the receiving end of buckets of rain, we felt like creatures from the lagoon. Fungus and mold had transformed our rubber boots into biological wonderlands. Our peeling, corpse-colored hands appeared permanently shriveled, like albino prunes. Night after night, we squeezed water out of our balled-up tent, which smelled like a wet dog, before erecting it and crawling inside with our sponges. Having done fieldwork on the coast, it was easy for me to empathize with Jill. Suddenly, I was right back where I started. What was I going to take for footwear? Finally, I decided on sandals, neoprene socks, and river shoes. In a large part, I didn’t want to leave anything else on my list behind to make room for boots. I willed myself to go with what I knew worked well on rivers. It did. A few years later, I traded the wet suit for a dry suit. Now if the weather conditions are particularly nasty, like they were on our trip from Gingolx (Kincolith) to Bella Bella, I might wear the dry suit with river shoes more frequently than usual. However, over the long run, most of the time I am happiest in sandals. I’m also grateful there’s been some great leaps in gear innovations (since I started outdoor adventuring and that Jill probably didn’t have access to at the time she did her wet trip). Staff at Pack Creek Bear Viewing Area were well dressed, complete with Xtratuf boots, on the rainy day that we visited. That’s me following behind. I stopped to marvel at the innovative Alaskan strategy of laying coarse gravel on the trail to increase the probability that bears will hear people coming. (It’s not good to surprise bears.) 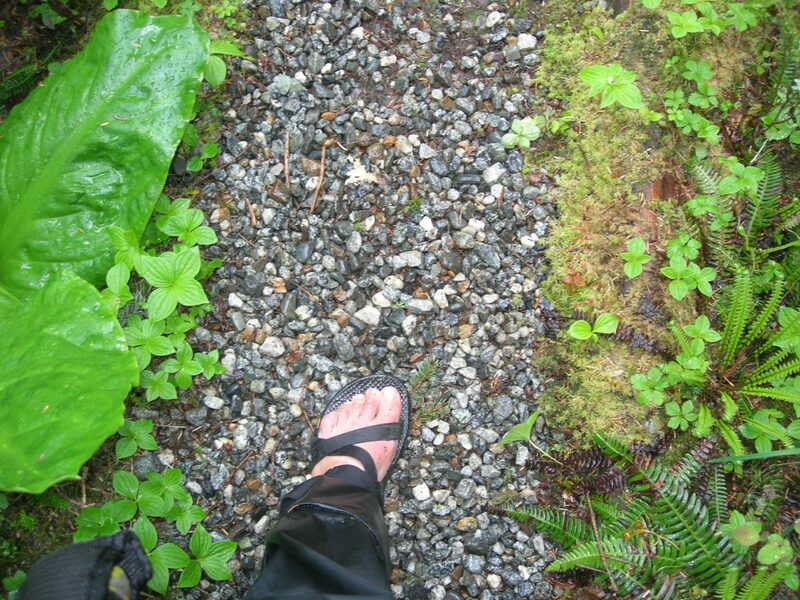 I’m in my trusty sandals, paddling jacket, and rain pants, warm and dry. Since time immemorial, many cultures have probably used variations of my open-air solution for footwear. I wonder why sandals went out of fashion? Maybe it’s a cultural disconnect from the great outside, psychologically and physiologically. I know that when I return to inside living, after I’ve been living outside for a period of time, the temperatures that people keep their houses at feel far too hot for my liking. But give me a few days of contemporary living and the discomfort fades. It might also be that I’m a physiological oddity when it comes to thermoregulation but I doubt it. Maybe, I have some research to do. If you’re not wearing sandals a lot already, you might want to try it. If it’s cold and wet outside, bundle up to keep your core warm and throw on a toque, it might just work for you too. Walking in bare feet is good for the soul. 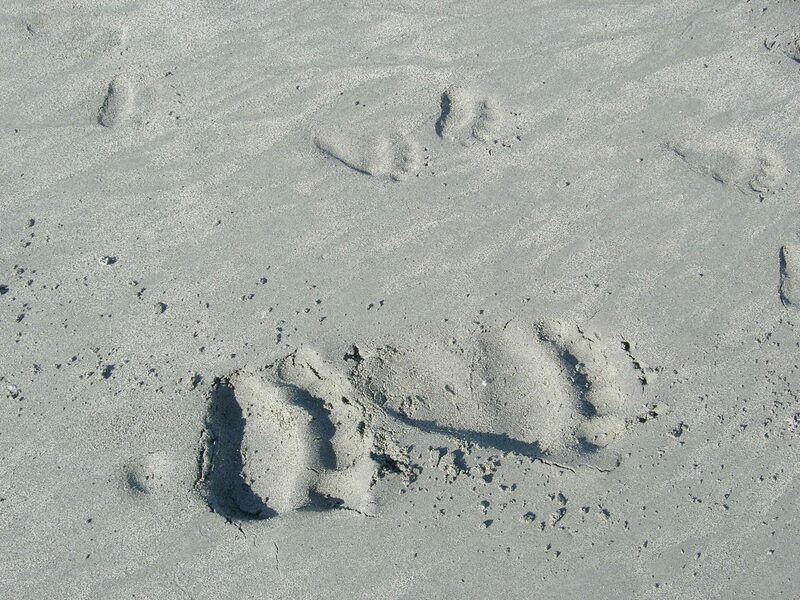 So is finding grizzly bear tracks left by a mom and her cub of the year! Fredston, J. 2001. Rowing to Latitude: Journeys Along the Arctic’s Edge. North Point Press. You bin busy girl! I like your writing, consise and to the point. Good luck with your travels, dry feet or otherwise! Thanks Allan! One of these days we need to cross paths out there on the mighty Pacific. Happy travels.